Emperor Tenmu (天武天皇, Tenmu tennō, c. 631 – October 1, 686) was the 40th emperor of Japan, according to the traditional order of succession. Tenmu's reign lasted from 673 until his death in 686. Tenmu was the youngest son of Emperor Jomei and Empress Kōgyoku, and the younger brother of the Emperor Tenji. His name at birth was Prince Ōama (大海人皇子:Ōama no ōji). He was succeeded by Empress Jitō, who was both his niece and his wife. During the reign of his elder brother, Emperor Tenji, Tenmu was forced to marry several of Tenji's daughters because Tenji thought those marriages would help to strengthen political ties between the two brothers. The nieces he married included Princess Unonosarara, today known as Empress Jitō, and Princess Ōta. Tenmu also had other consorts whose fathers were influential courtiers. Tenmu had many children, including his crown prince Kusakabe by Princess Unonosarara; Princess Tōchi; Prince Ōtsu and Princess Ōku by Princess Ōta (whose father also was Tenji); and Prince Toneri, the editor of the Nihon Shoki and father of Emperor Junnin. Through Prince Kusakabe, Tenmu had two emperors and two empresses among his descendents. Empress Kōken was the last of these imperial rulers from his lineage. Emperor Tenmu is the first monarch of Japan, to whom the title Tennō (Emperor of Japan) was assigned contemporaneously—not only by later generations. The only document on his life was Nihon Shoki. However, it was edited by his son, Prince Toneri, and the work was written during the reigns of his wife and children, causing one to suspect its accuracy and impartiality. He is also mentioned briefly in the preface to the Kojiki, being hailed as the emperor to have commissioned them. Tenmu's father died while he was young, and he grew up mainly under the guidance of Empress Saimei. He was not expected to gain the throne, because his brother Tenji was the crown prince, being the older son of their mother, the reigning empress. During the Tenji period, Tenmu was appointed his crown prince. This was because Tenji had no appropriate heir among his sons at that time, as none of their mothers was of a rank high enough to give the necessary political support. Tenji was suspicious that Tenmu might be so ambitious as to attempt to take the throne, and felt the necessity to strengthen his position through politically advantageous marriages. Tenji was particularly active in improving the military institutions which had been established during the Taika reforms. In his old age, Tenji had a son, Prince Ōtomo, by a low-ranking consort. Since Ōtomo had weak political support from his maternal relatives, the general wisdom of the time held that it was not a good idea for him to ascend to the throne, yet Tenji was obsessed with the idea. In 671 Tenmu felt himself to be in danger and volunteered to resign the office of crown prince to become a monk. He moved to the mountains in Yoshino, Yamato Province (now Yoshino, Nara), officially for reasons of seclusion. He took with him his sons and one of his wives, Princess Unonosarara, a daughter of Tenji. However, he left all his other consorts at the capital, Omikyō in Ōmi Province (today in Ōtsu). A year later, (in 672) Tenji died and Prince Ōtomo ascended to the throne as Emperor Kōbun. Tenmu assembled an army and marched from Yoshino to the east, to attack the capital of Omikyō in a counterclockwise movement. They marched through Yamato, Iga and Mino Provinces to threaten Omikyō in the adjacent province. The army of Tenmu and the army of the young Emperor Kōbun fought in the northwestern part of Mino (nowadays Sekigahara, Gifu). Tenmu's army won and Kōbun committed suicide, an incident known as the Jinshin War. In the 1st year of Kōbun (672): Emperor Kōbun, in the 1st year of his reign (弘文天皇一年), died; and his uncle Ōaomi-shinnō received the succession (senso) after the death of his nephew. Shortly thereafter, Emperor Tenmu could be said to have acceded to the throne (sokui). In the 10th year of Tenji, in the 11th month (671): Emperor Tenji, in the 10th year of his reign (天智天皇十年), died; and despite any military confrontations which ensued, the brother of the dead sovereign would have received the succession (senso); and after a time, it would have been understood that Emperor Tenmu rightfully acceded to the throne (sokui). As might be expected, Emperor Tenmu was no less active than former-Emperor Tenji in improving the Taika military institutions. Tenmu's reign brought many changes, such as: (1) a centralized war department was organized; (2) the defenses of the Inner Country near the Capital were strengthened; (3) forts and castles were built near Capital and in the western parts of Honshū—and in Kyushu; (4) troops were reviewed; and all provincial governors were ordered to complete the collection of arms and to study tactics. 674 (Tenmu 2): Ambassadors of Tane no kuni were received in the Japanese court. 680 (Tenmu 8): Yakushi-ji was founded in the Hakuhō period. Tenmu reigned from this capital until his death in 686. His wife, Empress Jito became the emperor until their son became the 42nd Emperor. The actual site of his grave is known. This emperor is traditionally venerated at a memorial shrine (misasagi) in Nara Prefecture. The Imperial Household Agency designates this location as Tenmu's mausoleum. It is formally named Hinokuma no Ōuchi no misasagi. In 675 Emperor Tenmu banned the consumption of domesticated animal meat (horse, cattle, dogs, monkeys, birds), from April 1st to September 30th each year, due to the influence of Buddhism. Wild game meat was exempt. The Nihon Shoki entry of April 15, 683 CE (Tenmu 12th year), mandates the use of copper coins instead of silver, suggesting that Japanese currency predates his reign. Excerpt of the 11th century edition. Early Japanese currency: Fuhonsen coins (富本銭), found in Tobishimaike (飛島池), thought to have been minted during the reign of Emperor Tenmu, end of 7th century, copper and antimony. Currency Museum of the Bank of Japan. In the Nihon Shoki, Tenmu is described as a great innovator, but the neutrality of this description is doubtful, since the work was written under the control of his descendants. It seems clear, however, that Tenmu strengthened the power of the emperor and appointed his sons to the highest offices of his government, reducing the traditional influence of powerful clans such as the Ōtomo and Soga clans. He renewed the system of kabane, the hereditary titles of duty and rank, but with alterations, including the abolition of some titles. Omi and Muraji, the highest kabane in the earlier period, were reduced in value in the new hierarchy, which consisted of eight kinds of kabane. Each clan received a new kabane according to its closeness to the imperial bloodline and its loyalty to Tenmu. Tenmu attempted to keep a balance of power among his sons. Once he traveled to Yoshino together with his sons, and there had them swear to cooperate and not to make war on each other. This turned out to be ineffective: one of his sons, Prince Ōtsu, was later executed for treason after the death of Tenmu. Tenmu's foreign policy favored the Korean kingdom Silla, which took over the entire Korean peninsula in 676. 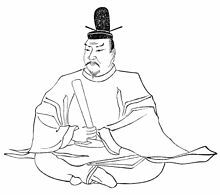 After the unification of Korea by Silla, Tenmu decided to break diplomatic relations with the Tang dynasty of China, evidently in order to keep on good terms with Silla. Tenmu used religious structures to increase the authority of the imperial throne. During his reign there was increased emphasis on the tie between the imperial household and Ise Grand Shrine (dedicated to the ancestor goddess of the emperors, Amaterasu) by sending his daughter Princess Ōku as the newly established Saiō of the shrine, and several festivals were financed from the national budget. He also showed favor to Buddhism, and built several large temples and monasteries. It is said that Tenmu asked that each household was encouraged to build an altar with a dais where a Buddha-image and a sutra could be placed so that family worshiping could be held, thus inventing the butsudan. On the other hand, all Buddhist priests, monks and nuns were controlled by the state, and no one was allowed to become a monk without the state's permission. This was aimed at preventing cults and stopping farmers from turning into priests. The years of Tenmu's reign were marked by only one era name or nengō, which was proclaimed in the final months of the emperor's life; and Shuchō ended with Tenmu's death. The early years of Tenmu's reign are not linked by scholars to any era or nengō. The Taika era innovation of naming time periods – nengō – was discontinued during these years, but it was reestablished briefly in 686. The use of nengō languished yet again after Tenmu's death until Emperor Monmu reasserted an imperial right by proclaiming the commencement of Taihō in 701. "The eras that fell in this reign were: (1) the remaining seven years of Shuchō [(686+7=692? )]; and (2) Taika, which was four years long [695–698]. (The first year of this era was kinoto-hitsuji .) ... In the third year of the Taika era , Empress Jitō yielded the throne to the Crown Prince." ^ a b Imperial Household Agency (Kunaichō): 天武天皇 (40); retrieved 2013-8-22. ^ Titsingh, Isaac. (1834). Annales des empereurs du japon, pp. 55–58, p. 55, at Google Books; Brown, Delmer M. (1979). Gukanshō, pp. 268–269. ^ "Tennō" at Critannica.com; retrieved 2013-8-28. ^ Asakawa, Kan'ichi. (1903). The Early Institutional Life of Japan, p. 313. ^ de Gruyter, Walter (1976). Ancestors. Paris: Mouton Publishers. ISBN 90-279-7859-X. ^ Brown, pp. 268–269; Varley, H. Paul. (1980). Jinnō Shōtōki, p. 44; a distinct act of senso is unrecognized prior to Emperor Tenji; and all sovereigns except Jitō, Yōzei, Go-Toba, and Fushimi have senso and sokui in the same year until the reign of Emperor Go-Murakami. ^ Titsingh, pp. 55–58; Varley, p. 44. ^ Emperor Tenmu's capital was built on the plain of Kiymihara at Asuka. ^ Nippon Gakujutsu Shinkokai. (1969). The Man'yōshū, p. 60. ^ "Kofun of Emperor Tenmu and Jito | MustLoveJapan". www.mustlovejapan.com. Retrieved February 17, 2017. ^ Totman, Conrad (September 11, 2014). A History of Japan. John Wiley & Sons. ISBN 9781119022350. ^ a b Brown, p. 269. ^ a b Titsingh, p. 55-58. Wikimedia Commons has media related to Emperor Tenmu.